Four years ago, Tina Pray gave scuba diving a try while on vacation with her boyfriend Joe Lockbridge. She was immediately hooked. She and Joe found they could enjoy diving without going on vacation when they joined the Maritime Aquarium at Norwalk dive team. In fact, they volunteer to dive into the shark tank on a regular basis. And while sharks aren’t the menacing creatures portrayed in the movie Jaws, Tina explained the meaning of a tickle stick. The extended T-shaped pole is handy just in case there’s a need to give a shark a little push, though none of the dive team could recall ever having to use one. In fact, they agreed it is the Trigger Fish that has the potential for a nibble or a bite. “Sharks are attracted to bright colors – red and orange especially,” Tina explained, noting that Saturday was the first day in a year since the sharks last saw Santa in a red dive suit. At about noon, dozens of families, mostly with young children, squeezed onto the carpet outside the shark tank in anticipation of a surprise visitor. 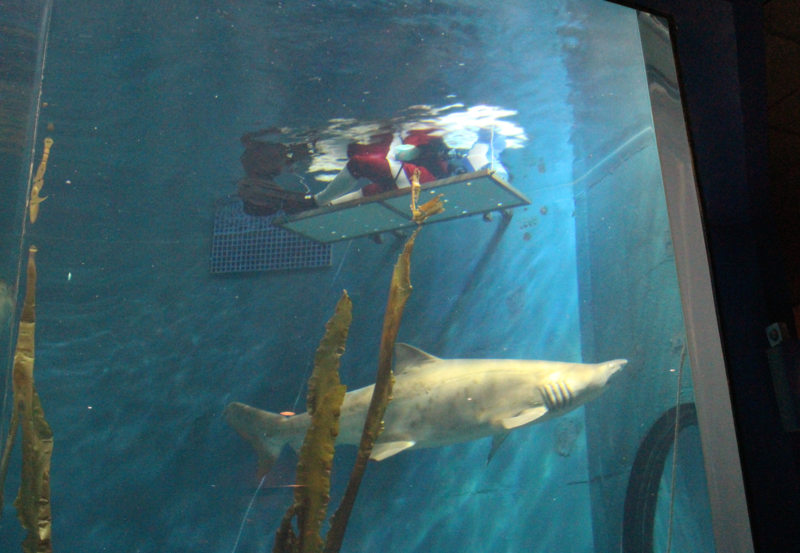 Charlie Adams encouraged the children to look up at the top of the tank where they saw Santa lower herself into the submerged platform and wait for the sharks to circle to the opposite side of the tank. When the area by the platform and the viewing window below were clear of sharks, Pray dove to the bottom of the tank where children screamed with delight. Cameras and phones clicked and flashed, and everyone took turns posing with Santa on the other side of the glass. It was fitting that Tina’s children, Parker (17) and Natasha (20), had their photo taken with Santa. They became interested in ocean ecology and Long Island Sound when they were little and visited the Aquarium with their mom. The aquarium’s Shark-diving Santa will appear on most Thursdays, Saturdays and Sundays in December. Click for details. In other areas of the Maritime Aquarium, guests had a chance to touch and hold crabs and check out the entries in the annual Lighthouse competition.